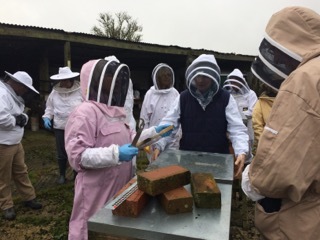 The club apiary is primarily a teaching resource to support training and development of our members, either hands-on at the apiary or via courses etc. Honey production is not a high priority but welcome if we get it! 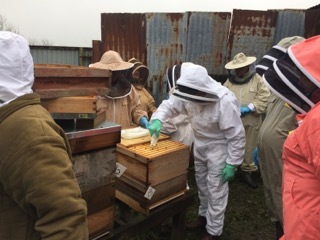 We currently have 6 colonies coming out of winter plus top bar hive(TBH) and 3 colonies in poly hives about to be moved to the new apiary site in Rowde. 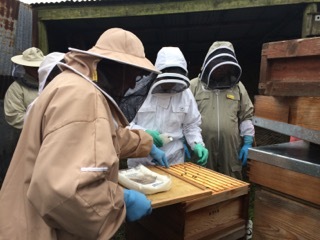 As the season progresses we would hope to expand to 10 colonies in total across the two apiary sites. This will include 2 for the apprentice scheme. We will also maintain the TBH and ,if swarms are plentiful, we will populate the skep hive. An observation hive will be made up as required through the 2018 season. 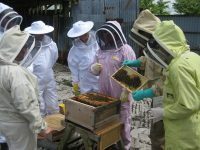 Any new beekeeper either without bees or just starting who wants to get some experience of handling bees, is welcome to come along to the apiary and perhaps join the A-team. If you are interested get in touch with the Apiary manager, David Brown. If you have not visited the apiary before, please read the Apiary Rules. Sun 29 July All Members 10:00 Honey harvest demo(if any!) – take remaining honey harvest – start apiguard, plus comb treatment. Q: Will I need to bring my own bee suit / veil? A: Please bring your own suit/veil if you have one. We do have some spare jackets available for guests but these can not be guaranteed. Long-sleeved shirt, trousers(not skin-tight), wellies and a pair of clean washing up gloves are also advisable. Q: What is in the bucket you put the hive tools in during and at the end of the Apiary inspections? A: To limit the risk of infection, all hive tools and gloves are rinsed in a disinfecting solution before, after and between each hive. This is replaced every month. Q: Why are the frames always held over the hives? A: There is always the risk that the queen is on the frame you are holding. If she drops off into the hive, then no damage done. If she drops off the frame outside the hive, and manages to avoid your feet, she will probably not make it back to the hive. (She may never have flown from the hive, possibly she was introduced to that hive or the hive has been moved). Q: What can I do about wasps around the hive? Q: How do I test for queenlessness? A: Get a donation of a frame of eggs/very young larvae and see if the bees draw out a queen cell. Q: How do I get a Booker’s card? A: Booker’s is a chain of Cash and Carry stores for trade only, but thanks to negotiations by Peter McFadden of Conway BKA members of the BBKA can shop at any Booker’s store. Each member should register individually with their local store by presenting their current BBKA membership card. You will be asked to fill in a registration form and will be able to shop straightaway with your Booker membership card being posted to you in the next 14-21 days.In particular, sugar can usually be purchased at Booker’s cheaper than other sources, which is useful if you need to buy it in any volume, as well as other items useful to beekeeping – gloves, icing sugar, etc. Q: What is Apiguard? How do I use it? Q: Who is an ‘A’ Team member?